There are many differing approaches to carving and we all have our own personal techniques; the enjoyment of carving is what matters. Craftsmen in all media throughout time have evolved and formulated the most efficient procedures and methods to generate items of quality in quantity and to a high standard. Their knowledge was passed on to further generations with the finest craftsmen gaining work and therefore earning more money. The company that I was originally apprenticed to and employed by for 28 years was Robert Bridgeman in Lichfield, Staffordshire. It was established in 1877 and employed 40 woodcarvers at its peak. There were two similar companies founded in Cheltenham during the same period; RL Bolton in 1866 and HH Martyn in 1888. The workforce of each of these would locate the most prestigious, lucrative contracts at other companies and seek employment with them. Their knowledge, procedures and techniques were therefore transferred and integrated into these companies and many others, creating a core of commercial ecclesiastical carvers structuring the approach of traditional carving. 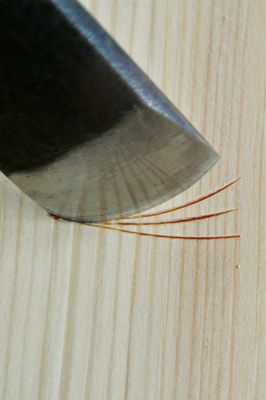 The technique that you must always adopt when applying yourself to any woodcarving is to work with the grain as much as possible. 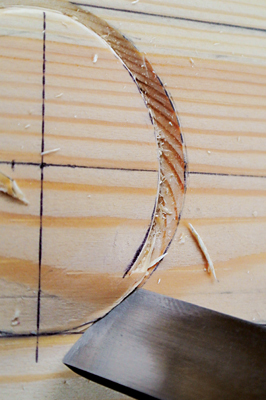 It's possible to work across the grain but basically it is out of the question to cut into the end grain. 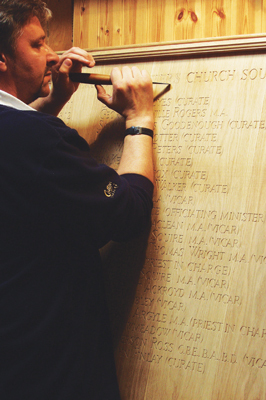 Why do tutors offer instruction on using a parting chisel for letter cutting? As stated in the previous article, cutting a letter 'O' will always tear one side of the cut. 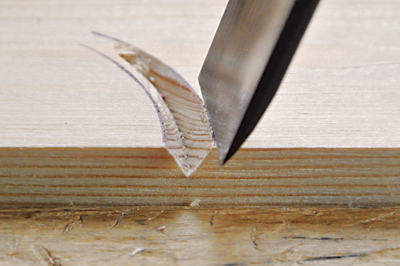 Applying a flat chisel for cutting a curved letter also replicates this problem when used against the grain. This is known to be the action of a stone carver, where it is described as 'chasing the cut', since the grain, or what are termed 'beds', in most stones may be virtually ignored. Generally this is why stonecarving is easier than woodcarving, since the grain does not have to be negotiated; this demonstrates the difficulty in moving from the stone to the wood industry. Difficulties also arise when forming the shallow and deep cuts at the bottom of the 'V' in lettering, with both of these tools. For example, it's virtually impossible to cut letters 25mm high efficiently in fibrous timbers such as oak (Quercus robur) or soft pine (Pinus spp.) with a parting tool. During my training, one of the many valuable forays into carving techniques was the importance of shaping your chisel's cutting edge to the bull nose. 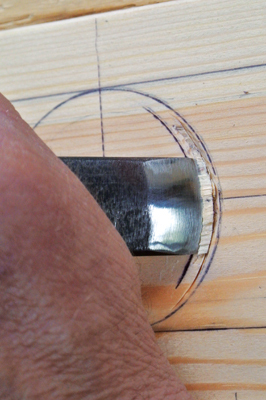 The essence of cutting a curved letter is to cut incised crescent shapes. 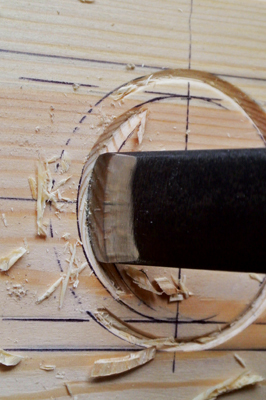 With a square-edged chisel you can cut the outside of a curved letter but not the inside, unless you 'chase the cut' as mentioned above. With a bull-nose it takes just two cuts; far more practical and efficient. This shape of the cutting edge assists in the carving of hair, eyelids, letters, volutes and where the incisions need to echo the curved background surface of mouldings. The list continues! 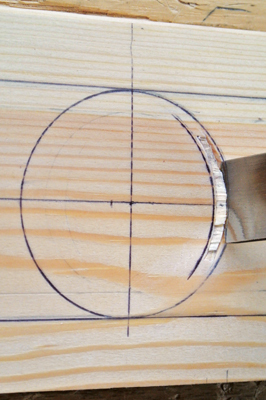 To achieve this shape, the cutting edge of the chisel should duplicate the curved section of the tool. It is practical to only incorporate it on 'slower' curved tools - flatter chisels - not fluters. Do not lose the corners of the cutting edge by rounding them, as this would imitate the shape of a fingernail. 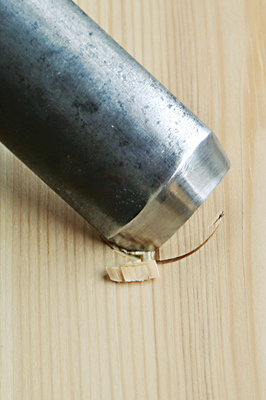 Initially, only regrind one of your tools and have a go - just enjoy. Many times I find with 'part-time' carvers, the chisel they find most useful in their tool collection is bull-nosed, yet they don't know why. It would be useful to have chisels that are versatile in many situations. Having a tool that aids you in only one function would be impractical, so we do not have chisels specifically for lettering. Some books instruct you to have chisels for a specific height of letter and another set for all subsequent heights; this would be costly and restrictive. Ideally it would be beneficial to have tools that cut letters of a certain height, with scope to cut letters within a margin of say 5mm taller or shorter. 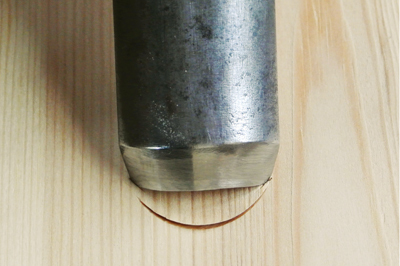 The bull-nosed tool allows this to happen; its shape allows you to roll the cutting edge of the chisel through the timber as you arc the handle in an upright position. You can tighten or straighten the cut by slightly twisting the handle while passing the handle over the cutting edge. 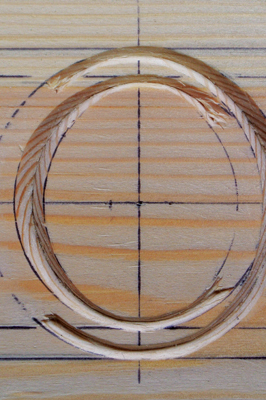 This is a necessity when cutting an 'O', as for optical reasons the 'O' has to slightly pass through the top and bottom lines and so isn't a true circle! If purchasing older tools you may already find they incorporate this cutting edge, but modern day carvers believe them to be worn, squaring the cutting edge and immediately reducing their versatility. There is a short introduction to cutting letters in an excellent DVD entitled Carving the Human Head by yours truly! 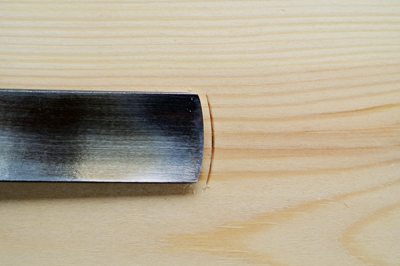 Throughout the DVD â€“ which can be purchased directly from me - the advantages of bull-nose chisels are explained. Surely the tried and tested procedures for the professional should also be appropriate for the part-time carver, not for the need to become commercial but just to complete your work with ease and efficiency. The methods of many instruction books are time-consuming if used commercially; our costs would escalate and the commissions diminish.